A few weeks ago, I accepted my first order for a T43 backlight kit. It turned out to be a c-c-c-c-c-combo-breaker! In the early days of software-controlled brightness, ThinkPads used an analog brightness signal like just about every notebook. It was generated by one of the D-to-A pins on the embedded Renesas H8S microntroller all ThinkPads used. As of the X40, ThinkPads went to using a digital PWM brightness control generated by the Intel Centrino ICH Southbridge. This made them kind of weird by laptop standards. It's one of the reasons I had to cons up custom LED drivers for my ThinkPad brightness kits. In general, the T and X series of the same generation shared a basic architecture. The planars were quite different, but the chipset and basic design were the same. Not so with the T4X and X4X. The X40-series is a completely different design from the T40-series. It uses a PWM brightness control. The T40, however, is analog like the older machines, which threw me for a loop at first. The good news is that I'd made working drivers for the X2x, X3x, T2x and T3x beforehand, so once I realized the T4x was an 'old' style, getting it to work wasn't hard. I can use the same positive-analog TLD2 hack that worked on the earlier models. The bad news is all my fabrication, based on the TLD3, is geared toward the PWM-based ThinkPads. The TLD3 boards aren't able to use a positive-analog brightness signal no matter the hack. For a TLD3, it's PWM input or nothing. I have on hand ~ 1500 TLD3 PCBs, waiting to be populated, for the usual PWM kits. I have only ~ 20 TLD2 PCBs left that can be pressed into analog use. Get 'em while you can. 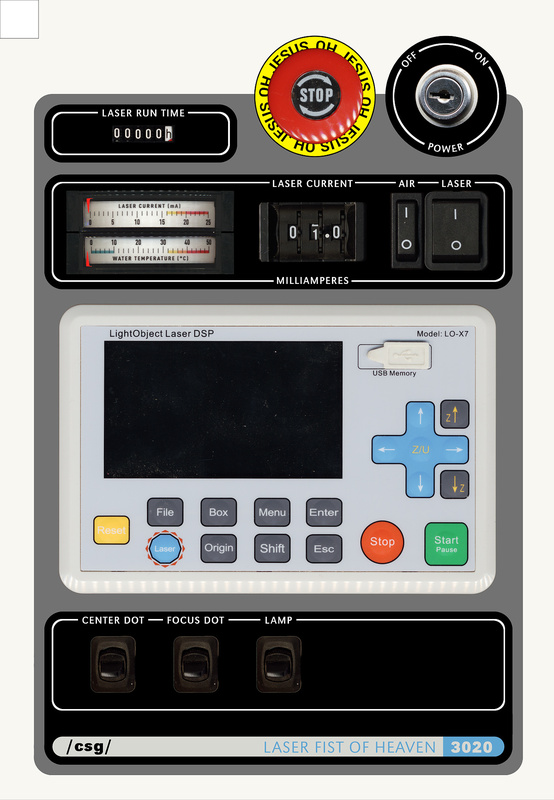 Given the two laser control panels and the design comparison, what's the actual goal here? The first goal is functional: I need to add a number of new control and status functions. Second: I am a vain man, and I want this tool to look a little less hokey. Not entirely, just a little. I mean, I gotta be me. The biggest addition will be a software control for the laser. I somewhat arbitrarily decided to go with a rebranded Anywells controller from LightObject-- I'll find out later if that was a good idea or not. The huge, spread-out, not-calibrated-to-anything digital PWM laser current control gets replaced by a thumbwheel implementing a Kelvin ladder. And instead of a 7-segment LED display that simply goes from 0-100, I'll use a good-old analog meter that measures actual milliampres. While we're at it, a matching analog meter reads cooling water temperature. Like on the American control panel, the key switch is the only power on-off, and the emergency stop will be a real immediate-stop interlock. I have an onboard air assist, so that needs a switch too, along with a lighting switch and two switched laser pointers, one a centering beam and another for focus. Last of all, arrange it in a more 'American' style: functions grouped together, consistent labeling, and no angry color salad. And just one or two inside jokes, because the tool is still a bit hokey. Making friends, influencing--- OMG IS THAT A DELOREAN? Yeah, I think this might be the place.